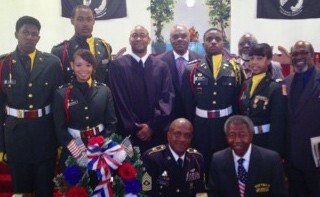 Connor’s Temple Baptist Church held its annual Veterans’ Day program Sunday, November 11, 2012, 10:00 a.m. worship service. The guest speaker was the Reverend McRae Mangum, United State Army. He delivered an inspiring Veterans’ Day message, not only to Connor’s Temple Baptist Church veterans but also to the congregation. Sister Patricia Sutton sang a resounding rendition of the National Anthem and Robert W. Groves High School JROTC Color guard performed the posting of the colors. Other high lights of the program were a Veterans’ Day history, read by Deacon Bernard Conyers; Sister Neoyshi Johnson read a roll call of all veterans in attendance. The services were concluded by the remembrance of the fallen with the ringing of the bells by SGM (R) Charles D. Johnson and the playing of “Taps”.